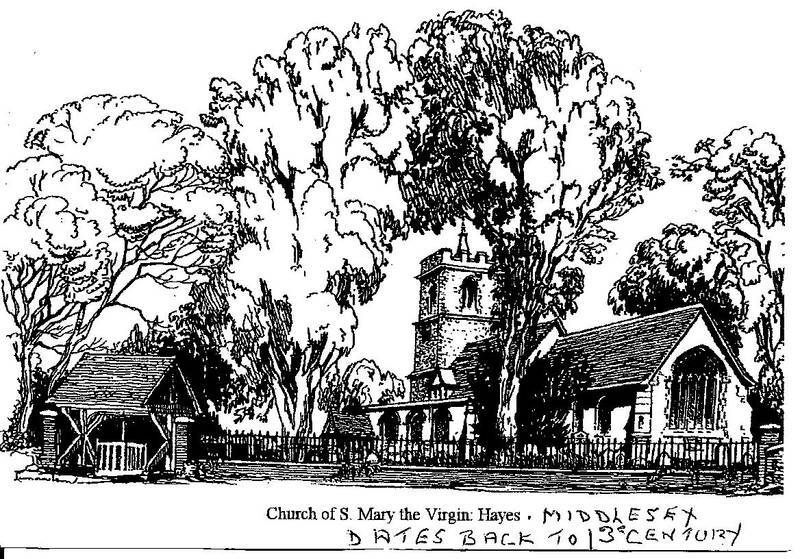 I found this sketch of St Mary's church in Hayes on the cover of a letter-card sent to me some years ago. I haven't the name of the artist but think it is very good. The handwritten information was written by the lady who sent it. She lived in Rectory Road nearly all her life. That's a striking picture. Maybe one day I'll go round and take a photo to see how the view may have changed. That's excellent, thankyou! I used to know a Miss Byles in Rectory Road. She was related to the owners of the Wimpy Bar at the top of Shakespeare. David .. I agree the picture is very striking and a more unusual way for the lovely church and gate to be depicted. I was christened there and went to some weddings there years ago. One was when two Mellow Lane pupils got married. (Barry and Patricia). Admin: I seem to recognise the name of Miss Byles in Rectory Road. I also have memories of going into the Wimpy Bar on the corner of Shakespeare Avenue. I knew Mrs Ward (Margaret) who worked in there but I didn't know who owned the shop. Mrs Ward lived locally in the Lothian Avenue area. She was a very friendly person.